Through the efforts of Bill Morris during 1947-1948, an attempt to form a club was made by a few avid enthusiastic Basset Hound fanciers. It wasn’t until the fall of 1951, however, that the Basset Hound Club of California was organized with Bill Morris as President. Those in attendance at that first meeting were: Mr. And Mrs. Mac Carlisle, Mr. And Mrs. Gill, Mr. And Mrs. Robert Hicks, Mr. And Mrs. Dow Loewe, Paul Nelson, Mr. And Mrs. Walter Rowley, Mr. And Mrs. Bill Morris and Mrs. Cordelia Skapinsky. In 1958-1959, the Club was incorporated in the State of California as a non-profit social organization, and membership reached 100. In 1960, our specialty broke all records with 105 entries (List of all BOB & BOS Winners beginning with 1966). In the early 1960’s, membership climbed to 200. 1996 membership exceeded 160, and today membership is approaching 200. 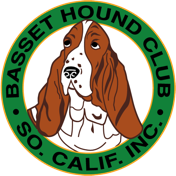 BHCSC is the largest regional basset hound club in the U.S.
1954 First Sanctioned Match. Began donating trophies to all-breed clubs to promote Basset entries. 1957 First Specialty Show in conjunction with Harbor City KC. 1965 First independent Specialty Show. Adopted Code of Ethics. 1969 Club members Ginny Jones and Joan Thurlow prepared study relative to jump-difficulties experienced by Bassets in Obedience Trials, submitted to American Kennel Club on 2/4/69; helped to lower height requirements. First Puppy Sweepstakes held at Specialty. 1973 First Obedience Trial held at Specialty. 1974 First Junior Showmanship classes held at Specialty. 1976 Barbara Dunning and Kati Netzley were first Co-Rescue Chairmen. 2000 Had back-to-back two-day BHCSC Specialty. 2006 Obedience Trials at Specialty opened up to all-breeds; Bassets have first priority in entry. 2015 Competition in AKC Rally was provided at both BHCSC Specialty Shows for the first time. 2016 The club celebrated the sesquicentennial of the contributions to the breed by Loard Galway in 1866. We introduced a modified pack competition to the Saturday BHCSC Specialty show and on Sunday worked with basset hound rescue groups all over the United States to have an Easter Basset Bonnet Contest to raise money for our club's Basset Hound Relief fund.